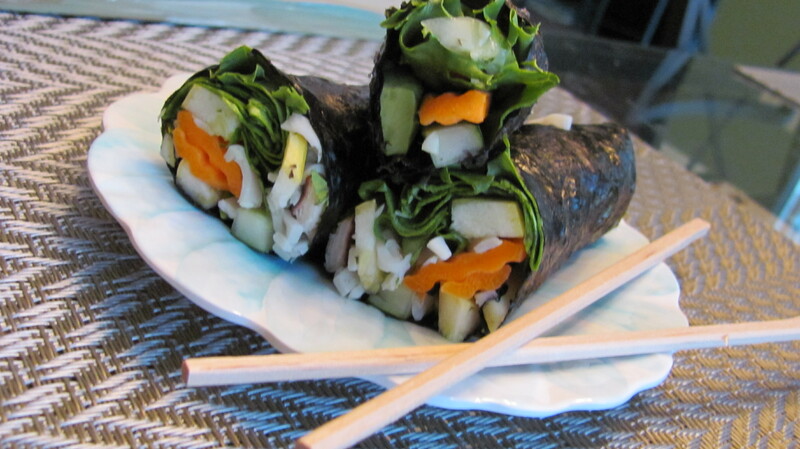 These wraps are chocked full of raw veggies and eliminate the empty calories regular sushi rolls contain by omitting the rice. My hubby and I both are huge sushi fans, and I wanted to make some this week for dinner, but I didn’t want to take all the extra time to cook rice, then season it and cool it. It’s a bit of a time-consuming process to do all that. So, there I was, with sushi on the brain and the brilliant idea to use the nori sheets to wrap around a pile of veggies. Nori are the black sheets of edible seaweed normally seen holding all the contents of a sushi roll together. This edible sea vegetable contains iron, plus an array of other nutrients such as vitamin A, magnesium, and other B vitamins. This recipe works best if you have one of those little bamboo roller mats. 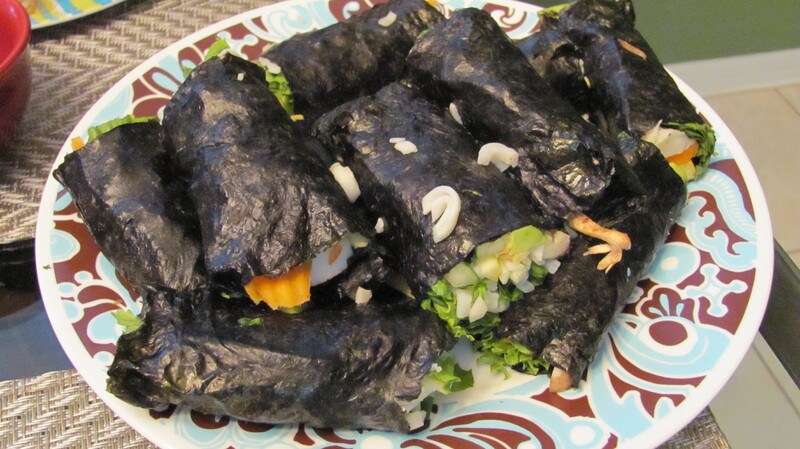 They’re a big help when pressing the roll together and making sure the nori is tightly bound around the fillings. You can find these in some grocery stores, like Publix Supermarkets that sell fresh sushi, or at any Asian grocery store in your area. If not, just order a nice little sushi rolling kit online, like this one, that contains two bamboo mats and an adorable wooden rice paddle to help you scoop and spread rice onto your nori. Ok, here’s the tricky part – using that bamboo roller mat. I highly suggest to cover the bamboo mat with plastic wrap and tape it on the side you will not be placing sushi on. This will keep pieces of rice (if you’re making sushi with rice) from going through the cracks. 1) Place one sheet of nori on bamboo mat, flush with the edge of the mat that is closest to your body. 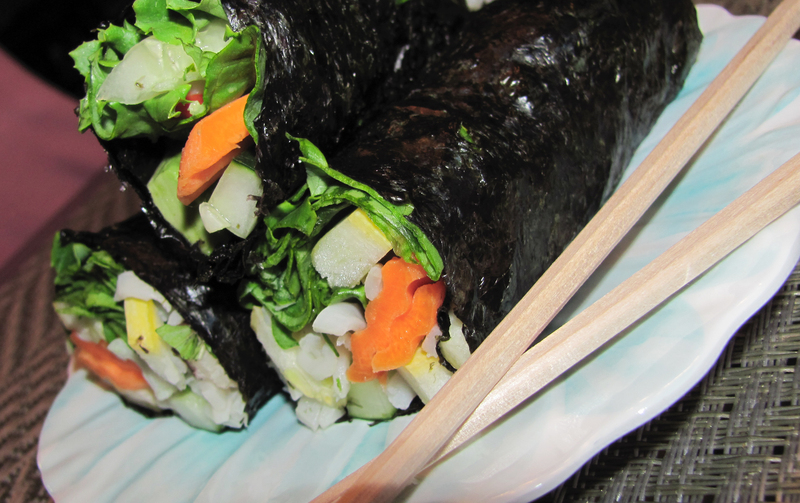 2) Place veggies on top of the sheet of nori, again near the edge that is closest to your body. Don’t overfill! For example, place 2-3 slices of avocado, 2 strips cucumber, 2 strips carrot, 2 strips squash, a sprinkling of mint and cilantro and for the lettuce, a good amount shouldn’t be bad since it will compress down a lot when rolled. 3) It helps to slightly moisten the other end of the nori with a little water to help it stick to itself. Do this before you start to roll. Don’t soak it; it will be a sloppy mess that will tear into bits. 4) Gently wrap the nori sheet up and over the veggies (don’t use the mat yet), away from your body. Once you get one good tight roll around the veggies, take the bamboo mat and cocoon it around the roll and press firmly to compact the ingredients. Gently remove the bamboo mat from the roll and tuck the rest of the nori around the roll, cover with the bamboo mat and press again. It’s a good idea to squeeze it all the way from end to end to make sure it’s nice and tight, and the contents are evenly spread throughout the roll. 5) Remove the bamboo mat, and you should have a nice and tight nori wrap! They won’t be quite as firm and solid as sushi rolls made with rice. 6) Cut the roll in half with a large knife moistened with a wet cloth. Keeping the knife wet helps it glide through all the ingredients. This is especially important if you are making sushi with rice. I wipe my knife off and re-moisten it with every cut through all that rice-y sushi. Serve with peanut satay dipping sauce or sweet chili sauce, or just eat them by themselves!